Conveniently serve heated chocolate and sauces to your customers with the Buffet Enhancements 1BHC245 Gold Chocolate Shot Drinking Machine. Featuring a heated dispenser with agitator, this product efficiently tempers liquids while preventing separation so they are ready for serving. Convenient to use, this NSF listed item is controlled by a toggle switch and knob, with a removable spigot for quick and mess-free dispensing. For refrigerated storage, its top container can be removed even when full. 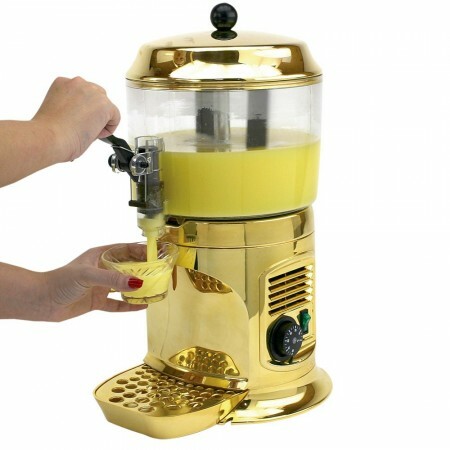 Combining style and exceptional durability, this chocolate shot drinking machine has a gold-finished body and a shock-proof non-toxic poly container. Dimensions: 13" x 10" x 19"